Gothenburg in Sweden and it´s different districts and suburbs. Gothenburg is more than just the inner city. 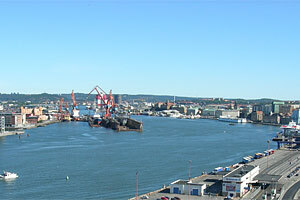 Gothenburg is not only the harbour and Avenyn, but also have a lot of different urban districts. We say Goteborg has 21 suburbs. The suburbs are divided into 10 districts. We present the suburbs below. The area is south along the coast. Here you can among others bicycle along the old Säröbanans embankment. For those who like to hike and see the nature, you can hike in Sandsjöbackas nature reserve. Backa was to the 1960´s a district with agriculture. Backa was known under the name "the gardens of Hisingen". Most of the big farms are gone today. Bergsjön is located north east of Gothenburg, approx 5 miles from the city centre. The area started to be built in the 1960´s and here you mostly see apartment buildings. It is green and a great natural beauty district. For you who loves the nature can take a trip up to the area around Lärjeån to Kortedala and Gunnilse. Biskopsgården mostly haveapartment buildings. Close to the nature. With the bus or car you can quickly go to the sea side. The City Centre border to Göta Älv, in the east to E6 (motorway), to the south to Mölndal and in the west to Linnestaden. Here you will find Gothenburgs historic buildings and the citypuls and all the shops etc. Here you have the closness to the Sea. Mostly family houses but also apartment buildings. Here you have a big shopping mall at Frölunda Torg. Located north east of Gothenburg approx 15 minutes from the city centre. Here you have the nature in focus. This area is famous for it´s green and nice area with forests and lakes. For you who like to exercise you can visit the big sports facility Skatås, with it´s football grounds, jogging tracks etc. The area is a mixture of apartments and houses. Several areas is located in small hills. In this area you also find small nice green areas. The residential area was built around the 50´s and 60´s and are mostly family houses and apartments. It was here the industrial period started, with SKF etc. In this area you will find old so called "Landshövdingehus", houses and apartments etc. This area is also famous for it´s nice green areas with a lot of woodland paths. Here you will find areas with both houses and apartments. This area is growing the whole time. Green areas and the beech wood is famous for it´s bird life. This is an inner city district. Here you will find many nice parks as Slottskogen and the Botanic Garden. This are the old parts of Gothenburg, with old building mixed with new buildings. At Linnégatan you will find many small shopes and also many restaurants. You can say that this is "the Little Avenyn". Lundby you will find at the island Hisingen, the area reaches along the river Göta Älv, from Älvsborgsbron to Tingstadstunneln. The area border to the big meadows out at the Sea. The new apartment area in the harbour, Älvstranden, is one of the most luxurious areas to live in Gothenburg. The area is located north east of Gothenburg. Here many young families move. A lot of green areas. Here you will find the so called sailor district in Gothenburg centre. In former times many people who worked in the harbour lived here. The area is very hilly with uphill and downhill slopes. The area is very beautiful with many special houses - the so called "Landshövdingehus" and here you can get a feeling of Gothenburg in old days. An island in the archipelago. You take the boat from Saltholmen and it will take approx 20 minutes. Here you will find many nice public bathing place. Tuve-Säve is the area from Bäckedalen in the south to the ferry at Kornhalls i the north. This is the only district with a ferry and an airport. Here you also find big nice meadows and farms. Here is also the car company VOLVO located. You will get the feeling of "country side". Many different areas with both green areas and also the closness to the sea. Here you will find both apartments, small houses and family houses. Here you will find public beaches and a marina. Mostly homeowners and terrace houses. A nice area with the feeling from the time when Gothenburg was a farmer and fishing community. This area is characterized by it´s closness to Gothenburg and to the area around Delsjön. When Gothenburg was founded this area were located very far away from the city centre.... today it is not. Many nice an cosy blocks and green areas.